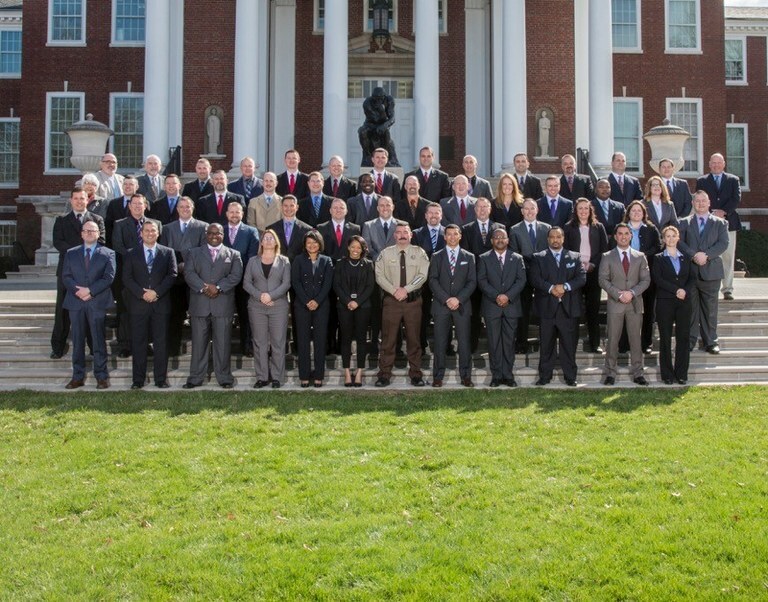 / Congratulations to the 139th Administrative Officers Course! Congratulations to the graduating class of the 139th Administrative Officers Course! On May 10, 2018, all 48 members from 46 agencies in 20 states graced the stage at the Crowne Plaza, receiving their well-earned diplomas after a semester of very difficult coursework! The Dr. William Walsh Director's Award is awarded to the graduate and undergraduate student with the highest grade point average (GPA) in each session of the Administrative Officers Course. Dr. William Walsh was the Director of the Southern Police Institute for 15 years – serving from 1993-2008. He has demonstrated strong commitment and support to SPI and to the Department of Criminal Justice for many years. This award for academic excellence was named after Dr. Walsh by his successor, Dr. Thomas Hughes, in 2009. It continues to be a coveted recognition at the conclusion of each semester. Lt. Eric J. Jones, Branson (MO) Police Dept. Lt. Frederick C. Sifodaskalakis, Simsbury (CT) Police Dept. The B. Edward Campbell Service Award is given by the Southern Police Institute. This award is for "meritorious service to fellow Law Enforcement Officers of the 134th Administrative Officers Course by Demonstrating Leadership and Commitment to the Shared Goals and Objectives of the Southern Police Institute." This award was created to celebrate the devotion and nearly 40 years of service to the University of Louisville and the Southern Police Institute by Professor Emeritus B. Edward Campbell. Major Adam Hirsch, Jupiter (FL) Police Dept. Lt. David Allen, Louisville Metro (KY) Police Dept. Lt. Nathan Banet, Harrison County (IN) Sheriff's Dept. Assistant Chief Penny L. Bowles, Bowling Green (KY) Police Dept. Sgt. Eric K. Danford, Collinsville (IL) Police Dept. Sgt. Jon P. Foreman, Milwaukie (OR) Police Dept. Lt. Robert Gutierrez, University of Cincinnati (OH) Police Div. Lt. Matthew C. Harden, DeKalb Co. (GA) Police Dept. Det./Sgt. Henry E. Harper, III, Rolla (MO) Police Dept. Deputy Chief Robert L. Harvey, Smyrna (GA) Police Dept. Capt. Ulysses C. Henderson, II, Lawton (OK) Police Dept. Lt. Paul L. Humphrey, Louisville Metro (KY) Police Dept. Sgt. Brittany Jackamonis, Richland Co. (SC) Sheriff's Dept. Assistant Chief David Kirby, Clarksville (IN) Police Dept. Sgt. Matthew J. Latzy, Cincinnati (OH) Police Dept. Capt. Kyle E. Livengood, Overland Park (KS) Police Dept. Lt. Luis Marquez, Yuma (AZ) Police Dept. Capt. John H. Mullin, City of Sandy Springs (GA) Police Dept. Capt. Derrick Napier, Frankfort (KY) Police Dept. Sgt. Alan D. Nickell, Seward (AK) Police Dept. Det. Sgt. Tommy G. Payne, Jr., Gulfport (MS) Police Dept. Capt. Denise Richardson, Pine Bluff (AR) Police Dept. Sgt. Corey J. Robinson, Louisville Metro (KY) Police Det. Sgt. Jennifer Rudolph Colemire, Covington (KY) Police Dept. Sgt. Vincent Rumsey, Fort Worth (TX) Police Dept. Capt. Rachel Saunders, Delray Beach (FL) Police Dept. Sgt. Tyrone F. Simmons, Mount Pleasant (SC) Police Dept. Capt. Matthew L. Smith, Paducah (KY) Police Dept. Sgt. Michael T. Sparrow, II, Chesapeake (VA) Police Dept. Sgt. Jason Watson, Palatine (IL) Police Dept. Lt. Paul J. West, Hartford (CT) Police Dept. Lt. Emily Wiggs, West Palm Beach (FL) Police Dept.